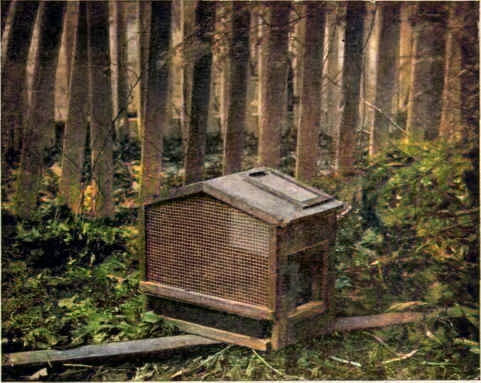 The small squirrel house, or cage, shown in Fig. 190, is made like a box (see box-making on this site), with the exception of the roof. It can be made of 7/8" or 3/4" stock. The dimensions of the bottom can be made to agree with those of any baking-pan you may have, as shown. The slide in the roof can be made of zinc or tin. That in the side can be of either zinc or wood. After the wire cloth has been nailed on a strip of wood can be nailed around the front edge as a moulding. 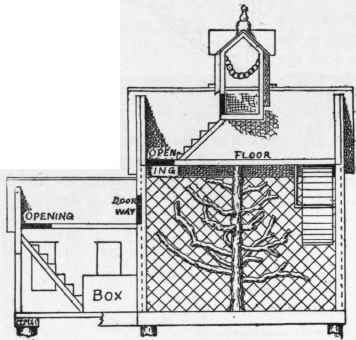 The little sleeping-box in the upper corner can be readily reached from the slide in the roof and connects with the floor of the house by a little door and a flight of steps (Fig. 191). The latter can be made as shown in Fig. 173. The most difficult part of this house to make nicely is the joining of the roof-boards. These must be bevelled at the ridge and the tops of the ends must also be bevelled where they join the roof. A more elaborate affair, shown below, can be made quite large and will give room for a whole family of squirrels. Four or five feet by about three feet will not be too large for the ground dimensions of the main part of the house. Regular sills can first be nailed together for the bottom of the main house. These sills can be from 1 1/2" x 2" to 2"x3". Perhaps an easier way is that shown in Fig. 192, in which three cross cleats or sills are laid and the floor nailed directly to these. When the lengthways boards shown in Fig. 192 are nailed to the floor boards and the sills the bottom will be sufficiently stiff for a squirrel house. 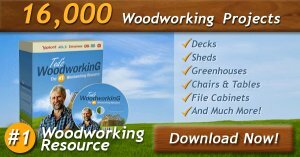 The sides and ends of the ell can be made of boards nailed together like a box, the openings for the doors, windows, etc., being first cut out; but the main part of the house should have posts at the corners to which the boarding at the ends is to be nailed. Rafters should also be put in at each gable. Plain sheathing will look better for the outside of this house than that with beads. After the outside has been boarded and the upper floors put in, the roofs and the cupola can be added. If the cupola is too difficult it can be omitted, as it is a luxury to which the average squirrel is unaccustomed. The stairs, the openings in the floors, the doorways, the sleeping-box, the revolving wire cage, the tree, and the swing in the cupola, are shown in Fig. 192. The stairs can be made as shown in Fig. 192 ; strips nailed vertically at the outside corners of the house, as in a real house, will give a more finished appearance. The window casings can be made by nailing strips on the outside. The glass can be held in place by strips, or small rabbets (on this website) can be cut as in a window sash. Each door can be made of a single piece of board, cleated. Several cages of various sizes can readily be built together, as shown in Fig. 193, which is merely a suggestion, for, of course, the shape, size, arrangement, and number of compartments must depend on the number and kinds of animals and the situation. Various combinations will suggest themselves as occasion calls for them. If you have such creatures as frogs, turtles, lizards, etc., a water-tank should be provided. This can easily be made by taking a tightly made flat box and caulking the cracks, or pouring hot tar or pitch into them and also tarring or painting the whole surface of the outside. A board can be fitted slantingly from the bottom to the edge, at one or both ends, to form an incline by which the users of this miniature pond can crawl in and out of the water. The box must, of course, be sunk in the ground inside of the cage.